We gardeners are designers, nurturers, and defenders of little island ecosystems — gardens — that are totally different than our surrounding native biomes. We compost our household garbage to make an amendment for the soil; plant our favorite non-native plants; stress about watering; admire each others’ efforts and brag about our own; and compete for the resulting food with our local garden-eating critters. We wait; we watch; we organize our seeds in anticipation. I thoroughly enjoy the process as well as the harvest. And yep! It’s spring again, time to get the soil ready to be the anchor and the nourishment to the seedlings I’ve grown that are ready to set out. Here in Oracle, AZ, I’m pretty confident that freezing nights have passed and that by the end of April, soils will be warm enough for great hot-season plant growth. Tomatoes, chilis, beans, eggplants, squash, melons, Malabar, and Egyptian spinach plus a palette of herbs, and some new experiments are on the menu this summer. Plants need pretty much the same things that we need for vibrant health: a wide range of available nutrients, the right combination of oxygen and carbon dioxide, sunlight, a diversity of microbes, and a comfy place to put down roots. We humans get our nutrients from our food and supplements; plants get theirs from the soil and soil amendments. Worm castings, aka worm compost or worm poop, are to the plant what probiotics are to our gut. The microbial richness of castings are critical to the cycling of nutrients in the soil for use by the plants, much as our gut bacteria help us use the vitamins and minerals in our food. Add a little mineral-rich rock dust and you’re on the road to a great organic garden that will yield vitamin- and mineral-rich produce. If soils lack nutrients, so will your produce. I grow worms, harvest their castings, and sell them both at a Tucson Farmer’s Market. One of my signs says “Don’t garden without worm castings!” It can be your first step in becoming an organic gardener and nurturing the earth. Growing organically is truly a total systems approach to life. Simply stated, we learn from the cycles of nature and apply those cycles to our gardens. For example, we ‘drop our leaves’ by composting our organic waste and returning it to the soil. We amend our garden soil with compost so that the many of the microbialy driven nutrient cycles supply our plants with minerals needed for growth. Interested in getting started with your own worm composting? I have a couple ‘wormshops’ coming up in April in the Tucson area – just check my website for details. There is also a large amount of info on the web about composting with worms, such as redwormcomposting.com. Also, many communities have their very own vermiculturists (worm growers) who can provide worms, instruction on composting with worms, and castings. If you don’t want worms, ask the grower if they might want your food scraps for their worms. I trade food scraps for worm compost, aiming for zero organic waste. Support your local vermiculturist whenever you can. If there is no local source, you can often find bags of worm castings at nurseries, and they can be ordered online as well. 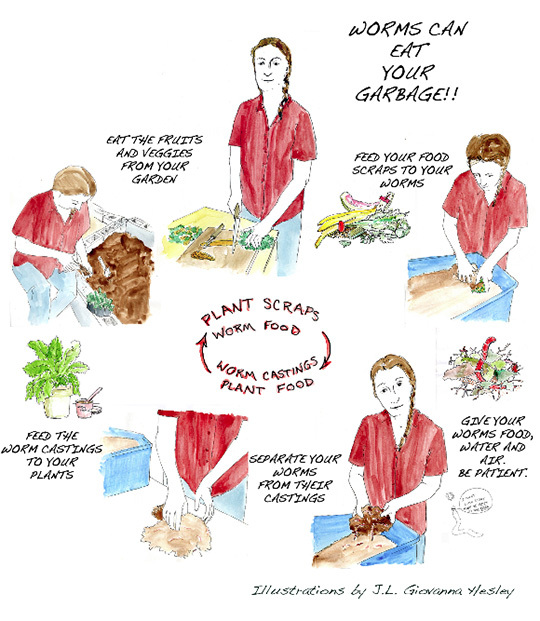 Here’s a cartoon of the whole vermicomposting process using a small, indoor bin – but you can also do it outside in a pile. I’ve spent close to 10 hours in the past two days with a film crew who is making a short film about Biosphere 2. I was interviewed about the experiences that I had building the closed ecological system, and about living inside for two years in the early ’90s. My experiences with the living systems in Biosphere 2 caused a paradigm shift in my thinking about gardening. I had become a gardener of the atmosphere as much as a gardener for food, finally viewing myself and my actions as a part of the whole earth system. 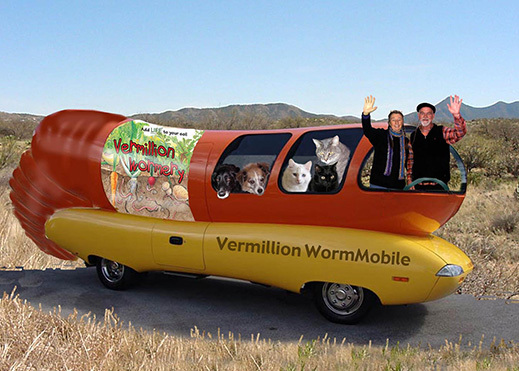 One of my dreams is a re-purposing of all of those weinermobiles out there to become wormmobiles to SPREAD THE WORM! Here’s to our collective vibrancy, the health of the planet and the positive impact that we can all have with directed effort! http://cwmi.css.cornell.edu/vermicompost.htm Don’t miss this video, “Vermicompost: Living Soil Amendment” from Cornell. They’ve done a tremendous amount of research about worm compost. http://www.youtube.com/watch?v=GEtl09VZiSU Video of my hero, Dr. Elaine Ingham, discussing the soil, the soil food web, and plant growth, plus a bit about the collapse of civilization through poor agricultural practices. http://www.wormwoman.com All things worm – how to start a worm bin, lots of resources, worm e-zine by the world’s foremost “spread the worm” advocate Mary Apelhof whose book “Worms Eat My Garbage” is the best beginner’s guide to worm composting. http://www.bae.ncsu.edu/topic/vermicomposting/index.html North Carolina State University is a leader in research, teaching, and use of worm compost. HPDI has always offered high-quality probiotic formulas, such as Polydophilus. We are now very pleased to offer Prescript-Assist™, one of the very best broad spectrum probiotic and prebiotic formulas available. 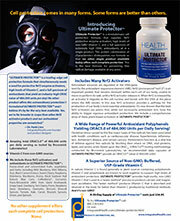 Probiotics are valued for their capacities to improve health. They boost intestinal health by increasing populations of beneficial bacteria, counterbalance the adverse effects of antibiotics on gut flora, help fight yeast infections, and much more. Current research shows that increasing population of “good-for-you” bacteria can exert beneficial effects beyond what anyone believed or predicted less than a decade ago. Some of these benefits are truly remarkable and the list of benefits seems to grow every year. Benefits reported from probiotics include 1) relief of stress, anxiety, and depression, 2) mood improvement via gut-brain signaling, 3) protection against free radicals, 4) anti-inflammatory properties, 5) improvement of glucose tolerance, 6) reduction of upper respiratory tract infections, 7) allergy prevention, 8) cholesterol reduction, 9) beneficial effects in liver disease, and 10) many other health benefits. It appears that the range of benefits of probiotics (including probiotic supplements) is so great and that more benefits (and their mechanisms) have yet to be discovered. People recognize that probiotics are found in a variety of foods with live or active bacteria cultures (often found in cultured or fermented foods), which include yogurt, sauerkraut, miso soup, buttermilk, and gouda cheese. Many traditional cultures emphasize the consumption of cultured foods. Consuming cultured foods is a great way to obtain probiotics naturally from your diet. However, taking a probiotic supplement offers additional benefits beyond the benefits obtained from dietary sources. These benefits can include a wider range and greater number of beneficial bacteria, ease of use, standardized amounts to assess intake, and ensuring high intake of probiotics when dietary sources like cultured foods are not readily available or desirable. Given the very broad range of benefits relating to use or consumption of probiotics, it is little wonder that they are so widely used, and so commonly recommended. Indeed, we recommend regular use of probiotic for a variety of health-related reasons. Our health recommendations often include the probiotic supplements we offer either as an “enhancement” supplement or sometimes as a “condition specific” formula depending on the health status of the individual and the conditions s/he seeks to address. While cultured foods are often simply part of a traditional diet, people also consume these foods or take probiotics for specific reasons, such as when their gastrointestinal tract is not functioning well. Other times are when individuals experience GI related symptoms, including abdominal bloating or discomfort, indigestion, nausea, bowel irregularity, flatulence, as well as general malaise, fatigue, or weakness. Because imbalances in the makeup of healthy bacteria found in the intestines can be the cause of health issues related to the digestive tract, it is important that if an individual decides to take a probiotic supplement that the supplement be of the highest quality and the greatest effectiveness. Not long ago, HPDI decided to make Prescript-Assist™ available to our customers. We did this because we believe Prescript-Assist is hands down one of the best probiotic formulas available. 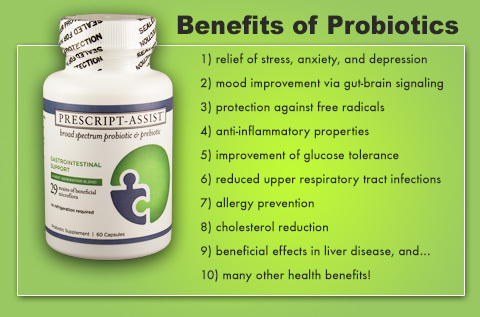 Here are reasons that anyone who takes (or considers taking) probiotic supplements would benefit greatly from taking Prescript-Assist. Prescript-Assist™ is a proprietary, broad spectrum formula providing 29 naturally resilient strains that support your body’s natural intestinal balance. Having so many strains means that this formula better reflects the great microbial diversity of the intestines vs typical probiotic products. In fact, more than 1,000 different species of microbes inhabit the human gut. Also of note: Prescript-Assist™ contains Bacillus subtilis, which is a well-proven probiotic species found in traditional foods. Most probiotic formulas provide only lactic-acid based bacteria. Lactic-acid bacteria are important, but they are hardly the only or the most important probiotic for humans. They are also quite fragile, and must be refrigerated if they are to remain viable. It is clear that the number and types of species found in the gut can be a primary difference between an optimal digestive system and immune system, and those less than optimally functional. In scientific studies, individuals exhibiting higher levels of gastrointestinal distress and gut irregularities have been found to have a correspondingly lower variety of beneficial bacteria in the intestines. Prescript-Assist™ is a next-generation, clinically proven probiotic supplement designed to to ensure maximum viability of the many organisms it provides. The formula offers inherent viability because the species it provides naturally adapted for survival in the human GI tract. That is, these 29 species are environmentally based (SBO) species drawn from the terrestrial microbiome where they have prospered and adapted for millenia to beneficially coexist with humans. This inherent viability avoids the need for nano-encapsulation or hard-shelled enteric-coated capsules, which both are essentially attempts to force viability of probiotic species rather than utilizing hardy strains that are naturally pre-adapted to our bodies. Thus, typical probiotic formulas contain low viability lactic acid bacteria that must be protected by technologies such as micro-encapsulation due to their inherent fragility. These fragile bacteria have a difficult time surviving because they are readily destroyed within the acidic environment of the stomach. While patented enteric coatings can help survival rates, the provision of high-viabiltiy organisms that reach the intestines intact due to the inherent strength of their natural spore structure makes more sense as a means to protect against degradation in the stomach and intestinal tract. Bottom line: Prescript-Assist™ provides bacteria that reach the intestines intact due to the fact that the spore structure protects against degradation or destruction by stomach acids. Prescript-Assist offers unparalleled shelf stability. It is well known that conventional probiotics (i.e., lactic acid bacteria) are readily damaged, degraded, and destroyed by the heat and pressure of the manufacturing process. They are also degraded by exposure to light and by temperature changes. Because they lack shelf stability, if they are not kept refrigerated, they often cannot provide a sufficient quantity of organisms by the time of ingestion. Proven Shelf Stable: With variations of less than 5% over two years from date of manufacture when stored at 98°F / 37°C . Routine viability testing confirms greater than 95% viability two years after date of manufacture — without refrigeration. See individual package for expiry. We at HPDI have always striven to bring our customers the best products and formulas available whether or not we ourselves design and produce them. When a formula like Prescript-Assist™ comes along (which is not every day), we are often quick to recognize its benefits, which in this case are many. We offer this unique formula knowing that it is safe, effective, and can help improve the health of our customers. We also know that Prescript-Assist can be used effectively in combination with our other supplements (i.e., foundational supplements and superfoods), including formulas we design specifically for GI health like Intestinal Rejuvenation Formula. Indeed, we ourselves take Prescript-Assist™ and experience major health benefits. In addition, we personally witness and hear from many individuals who take the formula based on our recommendations. The results reported are excellent. Messaoudi, M, et al. Beneficial psychological effects of a probiotic formulation (Lactobacillus helveticus R0052 and Bifidobacterium longum R0175) in healthy human volunteers. Gut MicrobesJuly/August 2011; 2:4, 256-261. Messaoudi M, et al. Assessment of psychotropic-like properties of a probiotic formulation (Lactobacillus helveticus R0052 and Bifidobacterium longum R0175) in rats and human subjects. Br J Nutr 2011; 105:755–64. Martarelli, D et al. Effect of a probiotics intake on oxidant and antioxidant parameters in plasma of athletes during intense exercise training. Curr Microbiol. 2011 June; 62(6): 1689–96. Gleeson, M et al. Daily probiotic’s (Lactobacillus casei Shirota) reduction of infection incidence in athletes. Int J Sport Nutr Exercise Metab. 2011;21:55–64. Posted on April 11, 2013 by Stefanie Lischer Liers, RN, MAOM, LAc. The HPDI Rejuvenation Program provides practices, protocols, and recommendations proven over 26 years. It is a complete program to rejuvenate, regenerate, and boost vitality to body, mind, and spirit. It is especially helpful for those who want to restore health. This article discusses the role of acupuncture within the HPDI Master Rejuvenation Program. The Rejuvenation program emphasizes establishing basic nutrition, foundational supplement formulas, and high-RNA Rejuvenate!™ superfoods and other sources of dietary nucleic acids. The program rests on six elements: 1) Attitude/Commitment, 2) Detoxification, 3) Preventing Toxicity, 4) Health Building Nutrition, 5) Building Powerful Immunity, and 6) Supporting Protocols. In Part Eight of the Rejuvenation Program series, we discussed the Massage Program (part three of four sub-articles on supporting protocols), which is an important supporting protocol in the Master Rejuvenation Program. In this article, we present another supporting protocol in our Master Rejuvenation Program: the Acupuncture Program. We include acupuncture in our Rejuvenation Program because it offers proven modalities for healing based in Traditional Chinese Medicine (TCM). These modalities include acupuncture, but encompass an entire system of medicine designed to maintain balance for mind, body, emotions, and spirit through the use of specific recommendations for diet, exercise, herbs, meditation, and more. TCM is a complete system that is designed to promote the flow of life energy (Qi) and to remove blockages that adversely affect its flow. It is the unrestricted, yet balanced flow of energy that promotes harmony in the body, and thereby helps create health. Like massage, acupuncture and other TCM modalities can improve the flow of energy, blood (circulation), and lymph, and therefore prevent or treat problems relating to blockage, statis, or lack of proper flow. 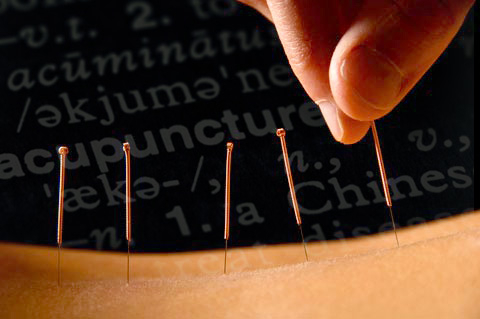 Acupuncture involves tapping into energetic meridians or pathways in the body using needles. There are 12 primary meridians and 8 extra meridians that are categorized according to yin (cool, internal, passive, etc.) and yang (hot, external, active, etc.). Traditional Chinese Medicine has been practiced in China for around 5,000 years. It involves not just acupuncture, but also Qi Gong (moving meditation), Tui Na (massage), and herbal and dietary prescriptions for bodily constitution and seasons. One basic premise is that it is the individual’s responsibility to keep themselves in balance through the use of food and plants as daily medicine, and the practice of Qi Gong or Tai Ji. The practitioner’s job is to educate the patient and assist when needed using acupuncture and other methods. Proper Eating: Moderate amounts of foods for a person’s constitution and the season. Proper Rest: Resting when tired and not pushing oneself when fatigued. Proper Thoughts and Emotions: Positive thoughts and meditation, and avoiding extremes of emotion. Proper Exercise: Daily moderate exercise including brisk walks and avoiding strenuous daily exercise. Practicing Qi Gong is an important way to replenish Jing/Essence after it has been spent. This involves both movement and visualization. For example, imagining light coming in to fill the lower part of your abdomen as you ‘Gather the Qi’ with your arms. Acupuncturists can recommend certain movements to keep energy flowing along a meridian. Foods and herbs are an important part of staying well and maintaining Qi and Essence. In China, eating a balance of the five flavors (sweet, salty, sour, bitter, acrid) is important at every meal. Depending on the season and your body constitution, you may need more of one flavor than another. For example, bitter foods are recommended in summer because they are cooling and cleansing. But if you are feeling deficient and weak, these may not be the proper foods for your constitution. In cooler winter weather, foods that are more warming/nourishing or acrid are generally more appropriate. This is one reason why consuming soups with root vegetables, hot peppers, and small amounts of red meat can be so satisfying during winter months. How can acupuncture benefit you? If you experience symptoms indicating that your body is out of balance, then acupuncture can help to alleviate those symptoms without the need for pharmaceuticals. The number of sessions it takes to resolve an issue depends on the amount of time you have been out of balance. For example, if you have back pain that began yesterday, you may feel relief after one session. However, if your back pain has persisted for years, then it may take weeks or months to return to balance, and you may also require treatment with herbs. Acupuncture is not just for musculoskeletal issues. It can be used to treat many health issues, either alone or in conjunction with western medical modalities. One of the advantages of acupuncture (and TCM generally) is that it works well with other elements (including Supporting Protocols) in our Rejuvenation Program. That is, the methods used are intended to help create health by nourishing the body, removing blockages (and/or toxins), promoting flow (i.e., energy, blood, lymph, etc. ), and supporting health holistically (mind, body, and spirit). Even if you are feeling pretty well balanced, acupuncture can help during the change of the seasons to keep you in balance, in much the same way that regular maintenance on your car helps prevent problems. Remember, acupuncture is most effective when you feel a resonance with your practitioner. Your results will be best when you can be fully relaxed with someone who you trust and feel good about. Rejuvenation Program Part Eight – Massage. Supporting Protocols Part Three – The Massage Program. The HPDI Rejuvenation Program provides practices, protocols, and recommendations proven over 26 years. It is a complete program to rejuvenate, regenerate, and boost vitality to body, mind, and spirit. It is especially helpful for those who want to restore health. The program emphasizes establishing basic nutrition, foundational supplement formulas, and high-RNA Rejuvenate!™ superfoods and other sources of dietary nucleic acids. The program rests on six elements: 1) Attitude/Commitment, 2) Detoxification, 3) Preventing Toxicity, 4) Health Building Nutrition, 5) Building Powerful Immunity, and 6) Supporting Protocols. 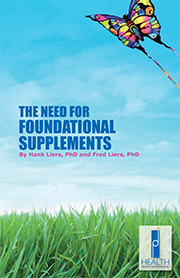 The six foundational elements remain powerful individually, but act synergistically when combined to support optimal health. The results are greatly improved capabilities for your body to heal, regenerate, rejuvenate, and restore its vitality. In a previous article in our “Rejuvenation Program” series (part seven), we presented our Magnesium Chloride Program (part two of four articles about supporting protocols), which is an important Supporting Protocol in the Master Rejuvenation Program. In this article, we present another supporting protocol in our Master Rejuvenation Program: the Massage Program. This protocol is an important element of the Rejuvenation Program that enhances the movement of blood, lymph, and energy throughout the body. It has been said that where there is stasis of blood, lymph, and energy there is illness. In this regard massage joins our hydrotherapy protocols that enhance cellular health throughout the body. In addition, massage works to significantly reduce stress and enhance mental functioning. I personally have been the recipient of more than 1,000 massages in the last 15 years and I don’t ever recall being less than blissful after each massage. In addition, I have given hundreds of massage treatments to my family, friends, and even my massage therapists, and I don’t ever recall any of them being less than blissful after a treatment. In almost all cases, pain has been reduced or eliminated. In some cases, longstanding health issues have been eliminated. In my home we have three massage tables, a far-infrared massage bed with jade rollers, a body bridge, a whole body vibration machine, over a dozen small vibration devices that can be applied to the body, and numerous electrical stimulation devices that relax muscle tension and stimulate acupuncture points. For many years we held meetings at our home in which we practiced Body Electronics, which is a method in which points on the body are held (a pressure technique) for long periods of time (usually 1–4 hours). Not only were the muscles surrounding these points softened and pain relieved, but also long-standing physical and painful emotional issues were often eliminated or reduced. My experience with massage has made it clear how important it is to attaining and maintaining good health. It is no wonder that massage is one of the oldest healing arts. Chinese records dating back 3,000 years document its use. The ancient Hindus, Persians, and Egyptians applied forms of massage for many ailments. The Greek physician Hippocrates recommended the practice of “rubbing and friction” for joints and circulatory problems. Our definition of massage is broad and encompasses many modalities, including: 1) Traditional Massage: the application of soft-tissue manipulation techniques to the body intended to reduce stress and fatigue while improving circulation, 2) Bodywork: various forms of touch therapies that may use manipulation, movement, and/or re-patterning to effect structural changes to the body, 3) Acupressure: the application of pressure to acupuncture points in order to adjust or correct energy flows in the body and simultaneously release muscle tension, and 4) Somatics: mind/body or whole-body approach as distinguished from physiology-only approaches. In fact, there are more than 250 types of massage, bodywork, acupressure, somatic therapies, etc. Many practitioners utilize multiple techniques. The application of these techniques may include, but is not limited to, stroking, kneading, tapping, compression, vibration, rocking, friction, traction, and pressure applied to the muscular structure or soft tissues of the human body. This may also include non-forceful passive or active movement and/or application of techniques intended to affect the energetic systems of the body. The use of oils, lotions, and herbs may also be included to reduce friction on skin and support therapeutic effects of the work. The concurrent use of transdermal magnesium oils and lotions and the use of essential oils are good examples of this (remember that transdermal magnesium can take away pain and relax muscles). Medical school students at the University of Medicine and Dentistry of New Jersey who were massaged before an exam showed significant decreases in anxiety and respiratory rates, as well as a significant increases in white blood cells and natural killer cell activity, suggesting a benefit to the immune system. Women who had experienced the recent death of a child were less depressed after receiving therapeutic massage, according to a study at the University of South Carolina. Studies funded by the National Institutes of Health (NIH) have found massage beneficial in improving weight gain in HIV-exposed infants and facilitating recovery in patients who underwent abdominal surgery. Researchers at the Touch Research Institute of University of Miami School of Medicine found that massage helps to decrease blood pressure in people with hypertension, alleviates pain in migraine sufferers, and improves alertness and performance in office workers. Massage therapy decreases the effects of anxiety, tension, depression, pain, and itching in burn patients. Abdominal surgery patients recover more quickly after massage. Premature infants who are massaged gain more weight and fare better than those who do not receive massage. Autistic children show improved behavior after massage therapy. The power of massage to take away pain, soften tight muscles, improve flexibility, alleviate stress, relax the entire body, improve balance, correct structural imbalances, etc. is something that we understand clearly and deeply. We believe everyone should incorporate regular massage into their Rejuvenation program in order to optimize the gains available from the program. That is, massage contributes to the synergy of the foundational elements in program, including the supporting protocols. Find a massage therapist with whom you are comfortable and schedule regular sessions. Or just begin to practice massage with your family and friends — you will get better as you do it! We have found that the longer you regularly have massage, the healthier you become. In this regard, it has been said that George Burns and Bob Hope received massages regularly for over 50 years and both lived to be 100 years old. For many years, HPDI offered Pathway’s Quercetin Plus formula. This product contained quercetin, rutin, and grape seed extract. About two years ago, however, the price of quercetin increased by a factor of four. We thought that this was a temporary increase due to a poor harvest, so we decided to wait until the price went back down before ordering again. Unfortunately, the price never came down! During this two year period, many of our customers asked about the product. In response, we decided to bring back the formula back. But we used the opportunity to make significant improvements to it based upon recent research. HPDI’s newly improved Quercetin Plus is a blend of bioflavonoids and polyphenols contained in a veggie cap. The active ingredients include the highest-purity quercetin, rutin, oligomeric proanthocyanidins (OPC) from grape extract (derived from grape seeds, skins, and stems), VitaVeggie® (concentrated extracts and whole-vegetable powders, and turmeric extract (95% curcuminoids)). Bioperine, a black pepper extract, is included because it enhances the absorption of all nutrients in Quercetin Plus. Through May 2013, Quercetin Plus is on sale for 20% off the regular price. You do not need a code. Just add it to your cart and the discount is automatic. Bioflavonoids work synergistically with Vitamin C to rebuild small blood vessels and other structural parts of the body. In addition, many polyphenols act as powerful antioxidants and Nrf2 activators. By activating Nrf2 signaling, polyphenols can increase cellular detoxification and production of internal antioxidant enzymes, thereby enhancing removal of reactive oxygen species (ROS) and toxic chemicals. Many fruits, vegetables, nuts, and seeds contain polyphenols and bioflavonoids. A diet rich in these foods may provide adequate amounts. However, if or when the diet does not provide an optimal intake of these substances (or if there is bodily injury or malfunction), we recommend a supplement providing 500 mg (or more) daily of these nutrients. 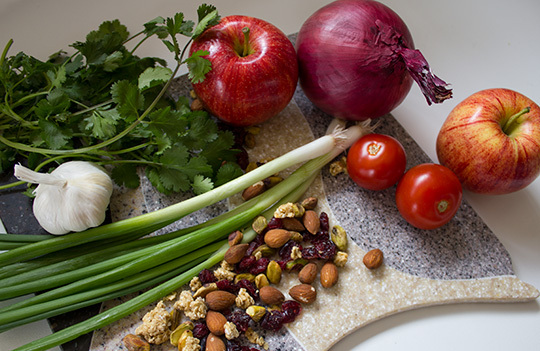 Quercetin (a bioflavonoid and known Nrf2 activator) exerts powerful anti-inflammatory effects, and may be helpful to individuals suffering from allergic reactions and/or from swelling due to injury. Quercetin also is known to reduce viral activity and may be helpful with chronic viral syndromes. A study published in 2010 by Dr. Mark Davis, et. al. suggestes that as little as seven days of quercetin supplementation at 500–1,000 mg/day can increase endurance without exercise training in untrained participants. These benefits of quercetin may have important implications for enhancement of athletic and military performance. This apparent increase in fitness without exercise training may have implications beyond performance enhancement itself to health promotion and disease prevention. Please watch the video (below) to hear Dr. Davis discuss his research on quercetin. Rutin, a bioflavonoid structurally similar to quercetin, is well-known for its effectiveness as a capillary strengthener and antioxidant. Rutin (quercetin-3-rutinoside) is a glycoside of the flavonoid quercetin. The chemical structure of rutin and quercetin consequently are very similar. Indeed, both rutin and quercetin are used in many countries as medications for blood vessel protection, and both are found as ingredients in numerous nutritional supplement preparations and herbal remedies. k-Rutin™ is an alkalinized form of rutin having greater solubility than the rutin included in conventional nutritional supplements. Rutin strengthens capillaries. It therefore can reduce symptoms of capillary- and circulatory-related health conditions, including hemophilia. It also may help prevent common venous edemas of legs and feet. Rutin acts as an antioxidant. A study of the superoxide anion scavenging activity of rutin and six other flavonoids (including quercetin, morin, acacetin, hispidulin, hesperidin, and naringin) showed rutin had the strongest scavenging activity. The oligomeric proanthocyanidins (OPC) in BioVin® grape extract (derived from grape seeds, skins, and stems) provide a highly bioavailable bioflavonoid complex as well as Nrf2 activators. They are extremely powerful antioxidants (20 times more powerful than Vitamin C in vitro), potent anti-inflammatories, and collagen strengtheners. OPCs readily cross the blood-brain barrier and thereby may be helpful to persons suffering from allergic reactions or from swelling due to injury. Other active ingredients in grape extract include anthocyanidins and transresveratrol. An ORAC5.0™ test on grape seed extract has shown an ORAC value of 94,000 micromole TE/g – a very high value! In addition, the test shows that grape seed extract is effective against a broad range of free radical types. VitaVeggie® is the finest high ORAC source of 100% non-GMO vegetable antioxidants, concentrated extracts and whole-vegetable powders. VitaVeggie® is derived from the richest broccoli and broccoli sprouts, vine-ripened tomatoes, the freshest leafy spinach and kale, baby California carrots, Brussels sprouts, and the highest-quality onions from the Pacific Northwest. More potent than fresh vegetables, just one gram of VitaVeggie® provides 5,000 ORAC units (peroxyl). VitaVeggie® is standardized to contain a minimum of 1,000 ppm sulforaphane and 2,000 ppm glucosinolates, which are both well known Nrf2 activators. Anthocyanins, lycopene, lutein, chlorogenic acid, beta-carotene, ellagic acid, quercetin and quinic acid are all found in VitaVeggie®. We have included curcuminoids (95%) in this product. This includes three main chemical compounds (Curcumin, Demethoxycurcumin and Bisdemethoxycurcumin) all derived from turmeric. Curcuminoids have been shown to be Nrf2 transcription factor activators. Studies have reported that curcumin and turmeric protect the liver against several toxicants both in vitro and in vivo. Curcumin is a potent scavenger of free radicals such as superoxide anion radicals, hydroxyl radicals, and nitrogen dioxide radicals. It exerts powerful antioxidant and anti-inflammatory properties. We include Bioperine®, a pepper extract, in the formula to enhance the absorption of all nutrients.